Location hunting for your big day? 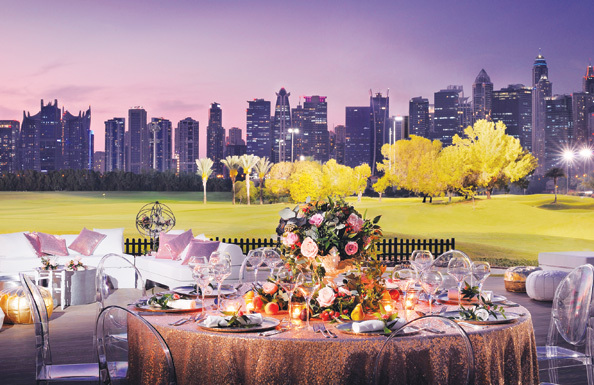 Before you finalise any details, visit The Wedding Fair by Emaar Hospitality Group. Brides-to-be, clear your calendar for February 3rd and 4th 2017 and head to the picturesque Burj Park, which plays host to The Wedding Fair by Emaar Hospitality Group. With four zones that will showcase Arabian, South Asian, African and Western wedding concepts, you’ll have the chance to plan the all-important details for your ceremony of choice. And it doesn’t stop there. Whether you’re planning an intimate wedding with fewer than 100 guests, or an extravagant affair on a larger scale, take the stress out of dealing with a long list of vendors such as venues, photographers, entertainment, spa services, food and beverage suppliers, hair and make-up artists, or gift registry options by planning it all with the help of the experts at the venue. Participating in the fair are Emaar Hospitality Group’s The Palace Downtown Dubai (imagine a ceremony at The Viewing Deck), The Address Boulevard Dubai, The Address Dubai Mall, The Address Dubai Marina (The Constellation Ballroom is as regal as it gets), The Address Montgomerie Dubai (for a splash of utter green on The Lawn) as well as Arabian Ranches Golf Club (Water’s Edge, anyone?) and Dubai Polo & Equestrian Club. And to add an even more unique touch, treat your guests with sumptuous offerings from Vida Food Trucks.